Winter is just a tough time to drive. Yes, it’s easier to drift all over the place, so that’s cool, and yes, there’s plenty of soft snowbanks to slide into when all that drifting inevitably goes pear-shaped. But you’re probably not always drifting on purpose. Things get slippery when you’re just trying to get to work. The lines are covered, your steering wheel feels like it’s been hanging out in the upper atmosphere, and the inside of your windshield fogs up until you’re ready to just go ahead and light it on fire. And the darkness doesn’t help. Driving at night is usually fine, because with the end of the sunlight comes the end of traffic. But that traffic is still there in the winter. There’s just more darkness. Raise your hand if you commute both to and from work in the darkness during the winter. The mud and ice crusting on your headlights is another problem. And let’s face it: If you have plastic headlights more than 3 or 4 years old, they’re probably all yellow anyway. Even stock fog lights don’t offer much aid. The best fog lights are designed not necessarily to be brighter, but to illuminate the road from a different angle. They’re aimed to “plane” the road surface so the light doesn’t bounce off the fog right back into your face. That’s where Hella’s driving lights come into play. Before we explain what driving lights are and how they can save your life, watch this helpful video Youtuber Peanutbutterjellytme posted a few years ago. The term “driving lights” comes from the early days of motoring. In times of yore, it was a rare event to see another car on the road, so you would keep your normal “driving lights” on unless you just happened to pass another dapper gentleman in his autocar, at which point you would both switch off your driving lights and turn on your passing lights. Nowadays, driving lights are just auxiliary headlights, extra help during the dark times. If you’ve ever seen a rally car racing at night, you’ll recognize driving lights. Each set of driving lights tends to be much more powerful than stock headlights. 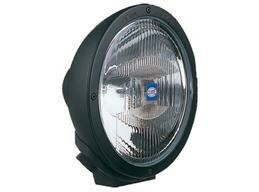 Take, for instance, the Hella Rallye 4000 LED. Each light uses just three power-saving LEDs to generate a total of 1500 lumens. That’s 50% more than the standard 1000 lumens of a stock headlight in a 2010 Ford F-series, like in the video. But you’re not just replacing your headlights. Driving lights add to them. So it’s really a 150% increase in light. Hella Rallyes aren’t just for commuter use. They’re extremely popular in Baja desert racing. There’s an important distinction to be made here, though. They also come in pencil lights, which are not designed for road use. A pencil light fires a focused, directed, narrow beam of light far ahead, which is helpful if you’re rocketing through the desert at 100 mph. Most Baja trucks carry a combination of pencil and driving lights. Baja isn’t the only racing Hella does, either. They’re a chief technology partner of Aston Martin Racing, who used a version of Hella Luminator Compact Xenon lights to win the 2009 Le Mans Championship in their LMP1 race car. Lighting at Le Mans is absolutely crucial. They have to be tuned like horsepower. They can’t be too bright, or they’ll blind drivers in slower cars ahead, and they can’t be too dim, because the back straight of Le Mans, known as the Mulsanne, allows cars to go up to 230 mph, and it goes completely black at night. So if Baja racers can trust Hella in the deep dark desert, and Le Mans cars can trust them on the Mulsanne, you can trust a pair of Hella driving lights to make your winter commutes safer, less stressful, and more enjoyable. Check out Hella’s full line and see how you can light up your winter. If using three pencil beam Hella 4000 lamps for driving in desolated highways together with s set of 2 euro beam lamps (Hella 4000 too) , sets to be used separately (pencil or euro) would I need do something to my alternator factory set up ?